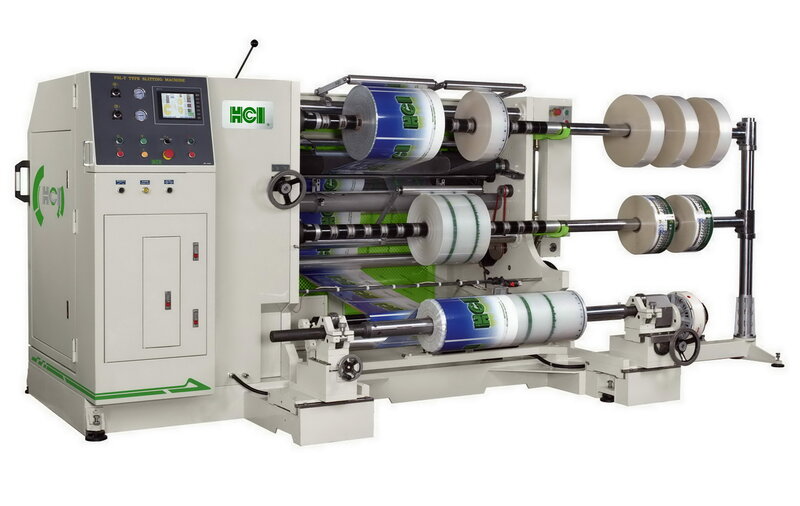 Slitting Machine Integration(FSL-KT) - HCI Converting Equipment Co., Ltd. The design concept of FSL-KT Integration Slitting Machine is Combine the advantages of two HCI best-selling models FSL-T and FSL-K. The unwind and rewind structures is design in the same side which provides the convenient operation. Also equipped with three motor control and PLC interface suitable for slitting various film, foil and paper rolls. Unwind and rewind in the same side, the operator can monitor the jumbo roll and slit reel at same time. Lift-up & floating type unwind stand with 3" air shaft. Single operator is required to manipulate and loading. Web guiding system enable to detect the printing line and web edge. Pneumatic nip roller for tension isolation point between the unwind and rewind. Equipped with left/right moving type trim winder on the machine side. Rewind Lay-on roller *4 sets. Three individual motors: 2 for rewind shaft, 1 for the main drive.